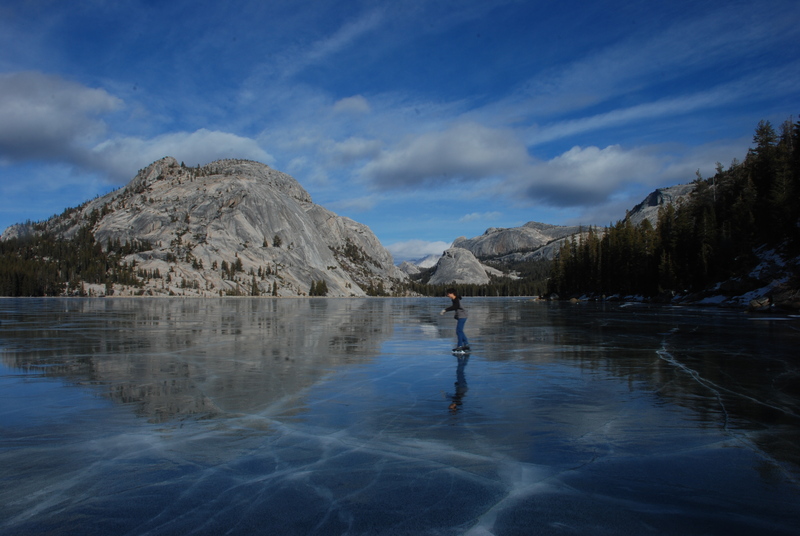 Early Winter in 2011 was uniquely both cold and dry, allowing visitors to reach a well-frozen Tenaya Lake. Winter is often an under-appreciated, and always rewarding time to visit Yosemite! Usually by the end of November the high elevation areas (Tuolume Meadows and Glacier Point) are closed for the season due to snow. But there is still plenty to see and do. Ice skating on the valley floor! Choose wool and synthetic fleece instead of cotton (useless when wet). You MUST carry tire chains in your car -- AND know how to use them. Give yourself plenty of travel time so you can drive safely in icy conditions. Restrict snow play to safe areas only; NOT on driveways or alongside busy roadways!